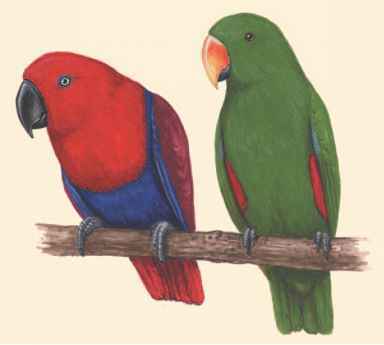 Physical characteristics: Adult males have an orange cheek patch, chestnut ear patches, black barring at the throat, red eyes, white-spotted chestnut flanks, black and white bars on the tail, a gray head and back, orange legs, and a red bill. Adult females lack most of the colors of the males, but do have an orange bill. Juveniles look similar to females but have a dark bill. Adults are 3.9 to 4.3 inches (10 to 11 centimeters) long and weigh about 0.4 ounces (12 grams). 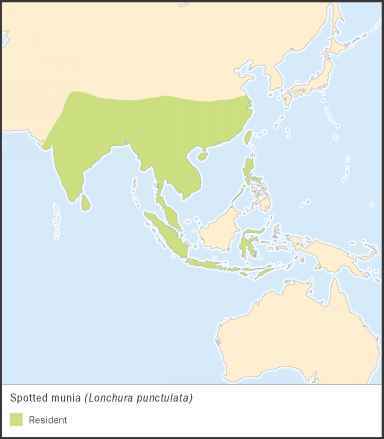 in Timor (an island in Southeast Asia) and the surrounding Indonesian islands. Habitat: Zebra finches inhabit a wide variety of habitats but prefer open areas such as plains, woodlands, savannas (flat grasslands), mulga scrubs (acacia [uh-KAY-shuh] trees that grow in arid regions of Australia), grasslands, salt marshes, orchards, cultivated areas and farmlands, and inhabited areas and gardens. Diet: These birds feed on a variety of grass seeds and shoots, mostly from the ground, but also eat insects. They are able to live up to about 500 days without drinking water. Behavior and reproduction: Zebra finches are very social birds that are found in pairs but more often found in large flocks. Their call is a "tya" or "tchee." Males courting females give out a mixture of trills and nasal notes. They build flask-shaped nests of many types of materials but mostly of grasses that is lined with feathers and wool. An entrance tunnel is built on the side. Sometimes other bird nests or roosts are used, often redone to suit their own needs. Females lay three to eight white eggs. The incubation period is eleven to sixteen days, and the fledgling period is fifteen to twenty-two days. 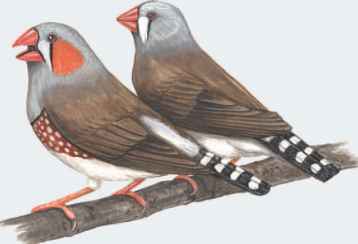 Zebra finches and people: People often keep zebra finches as pets. They are often bred, studied, and sometimes domesticated.